Home→Recipes→Simple Creamy Strawberry Fruit Dip! Simple Creamy Strawberry Fruit Dip! Delicious, Creamy Strawberry Fruit Dip made with cream cheese, cool whip and strawberries. It is simple, quick and yet SO GOOD! With all the summer barbecues coming our way and potluck meals, life is always moving, but we never have enough time to make something classic and homemade. This fruit time is simple, easy and quick. You just need a few ingredients to make this Creamy Strawberry Summer Fruit Dip. Any fruit combo under the sun would work. Anything cut up and in-season is fair game. Sweet, whippy, and impossibly creamy, this fruit dip is unlike anything – EVER. And I really mean it. My kids love this recipe and I dare say finger licking good. I feel as if they could totally skip the fruit and grab a spoon and go to town. The best part? The recipe only contains four ingredients. You could prepare a big bowl or tray of fruit to pair with the dip or make super-cute fruit kabobs for dunking. Either way, you do it will be yummy! First thing is first, you are going to want to crush up your fresh strawberries. You can often substitute for frozen strawberries. I have done this in the past. Just make sure you let them sit out on the counter until completely defrost, then crush. Next, you will want to whip your cream cheese with electric mixer until smooth. Add in cool whip; fold until incorporated. Then add your crushed strawberries, extract and blend until smooth. It is okay to lick the beaters. This is the best part. I can remember doing this when I was a kid. Now I let my kids do it all the time. Cut up some fresh Tropical fruit and serve with the dip. HECK! Just grab a spoon and enjoy without the fruit. I won’t tell. You can’t really go wrong with this super simple creamy strawberry fruit dip. Hello Summer! 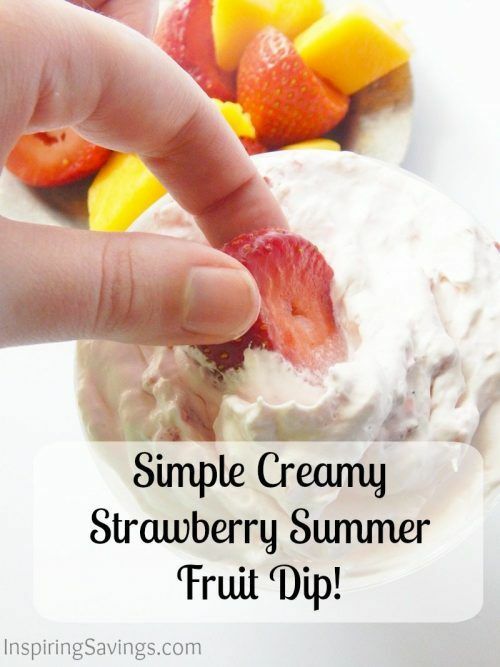 Simple Creamy Strawberry Summer Fruit Dip! Crush up your fresh strawberries. You can often substitute for frozen strawberries.